Joint problems are a huge and growing concern for many people throughout the world. In fact, 70 million prescriptions and 30 billion over-the-counter joint medications are sold every year in the United States alone. The pain and decreased function and mobility that go hand-in-hand with joint issues can have a hugely negative impact on people’s quality of life and lead to serious disabilities. Take two capsules with a full glass of water twice daily. 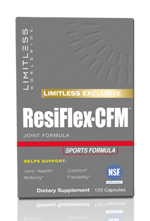 ResiFlex-CFM™ Joint Formula may be taken with or without food. WARNING: If you are presently taking any prescription anti-inflammatory medication, check with your doctor before taking this product or discontinuing your present medication. Not intended to diagnose, treat, cure or prevent arthritis. This product should not be consumed by individuals with a history of gastric or duodenal ulcer, individuals on H2 blockers or subjects on proton pump inhibitors. Do not exceed suggested daily serving. Not for use by individuals under the age of 18 years. Do not use if pregnant or nursing. Keep out of reach of children. Use only as directed. Scutellaria baicalensis (root) Extract, Acacia catechu (bark) Extract, Alfalfa (leaf) Powder, Celery (seed) Powder, Burdock (root) Powder, Sarsaparilla (Smilax medica) (root) Powder, Cayenne Pepper (fruit) powder. Other ingredients: Rice Flour, Gelatin, Magnesium Stearate, Titanium Dioxide, Silicon Dioxide.